Mindum’s shoehorns — a study of method. Update 19 November 2018: I’ve struck out part of the text below, because I’m sure I was wrong about the use of heat. I’m certain the triangles are done with an edged tool on two sides of the V, with the remaining waste being picked out with the point of a tool. They are flat at the bottom because of the way horn delaminates. He’s just working with the grain. The fact that every known example gives or gave both the owner’s and maker’s name suggests the possibility that Mindum was an amateur worker in horn who made them as gifts for his friends. 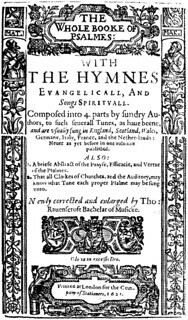 The most recently uncovered horn (Francis Hinson, 1600) bears a legend saying it was a gift from Margaret and Elizabeth Smith, so we now know that he did commission work on at lest one occasion. Evans justified the amateur assertion on his name not appearing on the rolls of the Horner’s or any other company in London. We don’t know how thorough her research was, whether a document bearing his name may have been lost in the Great Fire or if he worked as a ‘stranger’ (ie, not a guild member) working sans license. It is therefore still possible that he was a professional horn worker. I think Joan Evans and Cora Ginsberg come close when they respectively say he wasn’t a professional horner and his design elements come from design books of the period. I’d like to go further. I don’t think he was a horner at all for a number of reasons. Ignore the decoration for the moment and look at the shape of the horns. Some are from the left horn, some from the right, some terminate in hooks, some are round and others are almost square. Most are bored near the tip for a string or to hang from a hook but the holes are different diameters and different distances from the end. 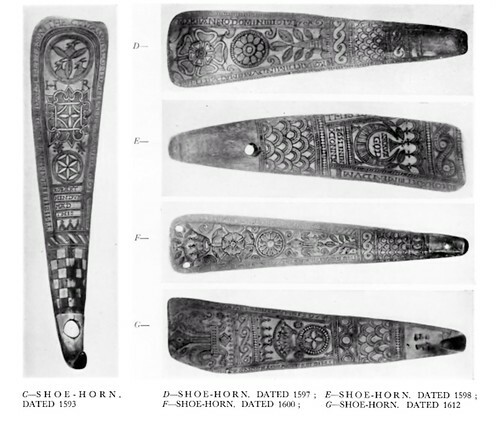 It looks like the shoehorns were made by a number of different people, I’m sure I can pick at least three different makers just from the finish of the holes and sides, leading me to believe Mindum bought finished undecorated shoehorns from his local horners ready for use. This was a normal process in the sixteenth and seventeenth centuries. A brief digression on the nature of the legislative framework the guilds operated under is probably in order here. For a cordwainer to make a pair of shoes, for example, the skin would have first been stripped by the butcher, cleaned and tanned by a tanner, then worked, dyed and tallowed by a currier before arriving in the cordwainer’s workshop for cutting and assembly. Any metal fittings required like aiglets or buckles would be made by a loriner [statutes 5 Eliz. c. 8. and 1 Jac. 1. c. 22 regulated the leather industry]. The horn and other industries were similarly regulated. My own experiments leave me wishing I could buy finished horn, too. Preparation is filthy, smelly work, but unfortunately necessary. Before inking a design, the horn has to be shaped and polished or the ink/paint bleeds along the imperfections in the surface. It’s better if it is polished before carving because that gives the most even finish and doesn’t end up wearing away parts of the design. There’s differences between Mindum’s work and the way the work of horners is usually decorated. Shoehorns , cider cups and powder horns we almost invariably find them either plain or decorated with a design executed with fine chased lines, all of about the same thickness. 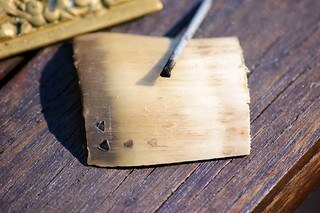 These fit within the scrimshaw tradition. Mindum’s are a riot of different thickness lines, solid shapes and different colours. Had he gone through apprenticeship in the guild, the guild structures and rules would ensure his work would have been more evolutionary than revolutionary. On the left is my photo of the shoehorn from the reign of Elizabeth in New Place Museum attached to Nash’s House in Oxford. 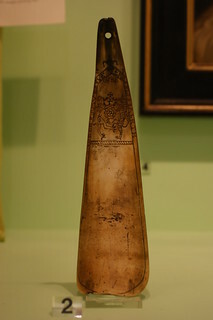 The centre horn is from 1595, published in the Journal of the British Archaeology Association1. On the right is one in the Museum of London, dated by them to 1590. All of these have the design the correct way up when in use, Mindum’s horns display a more creative approach to the concept of “up”. The dedication and date almost invariably flow around an arch along the outside edge of the horn. The 1598 horn shown in the monochrome image from the Burlington Magazine higher up this post has lines of text facing two directions, SARVE GOD is the right way up when held in the hand, ANNO DOMINI 1598 is the right way up when used in the shoe or hung from a hook. The cider cup below is probably 100 years later than the shoehorns, based on the clothing and musket but displays the same techniques as the show horns. If he wasn’t a horner, what did Mindum do? Let’s look at the materials and his handling of them. Horn has a really strong grain, straighter but in may ways less forgiving than wood. Robert Mindum’s work displays a good understanding of the properties of the grain and doesn’t seem to have had any problem with the curves or circles. The design is well executed, filling the available space while working around things like the hole for the loop. Cuts are generally evenly spaced and of even depth so he was certainly used to carving. Mindum’s mark-up and use of construction lines don’t appear on any horn work I’ve seen other than his, but was a common way of marking woodwork joints and for carving. We see them set out for artists and printers in Albrecht Durer’s Of the Just Shaping of Letters. 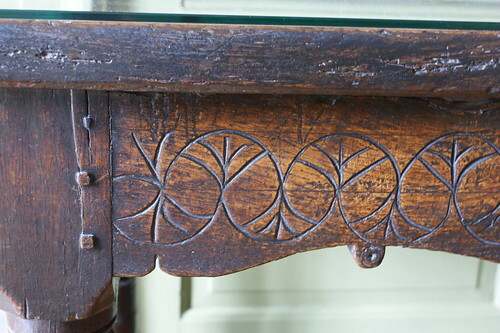 Here’s the same technique used to mark up the decoration on a Tudor period table skirt. Note the use of vertical and horizontal construction lines, the design runs on to the table leg at the bottom left. Tudor table, The Red Lodge Museum, Bristol. Compasses were used extensively in the layout by Mindum for circles, arcs, roses, stars and scroll work. The centre points are clearly visible and have been deliberately incorporated in to the design. Ricard Gibon Anno Domini 1612 in the Horner’s Company collection. Both flowers, the scroll work, curls and possibly the scale pattern near the point all show evidence of construction using compasses. Interestingly, it is in the scroll work that we see most of Mindum’s mistakes occur. He commonly used the same spacing between centres on the wide part of the horn as on the narrower part, with the result that on the narrow parts, the loops run off into the border. I’m left with the distinct impression that he was more used to working in rectangular spaces than the oddly rounded triangular ones you get with shoe horns. While much of the design is engraved, I’ve always wondered about the small triangles that he edges much of his design with. They also appear in crosses on the points of his crowns, and always seem to be the same two sizes from one horn to the next. Cutting these with an edged tool would result in in a “Y” shaped groove in the middle, which isn’t apparent on Mindum’s work, his always appear to be dead flat on the bottom. There isn’t much depth in horn either, the triangles of this width would probably go through, or at least form a weak point so we’d see them perforating and leaving a jagged edge as the horn wears. The alignment is different to his neat cuts, rather than careful and slow, it looks like he’s, let’s not say rushing, but rather working quickly for some reason. I think what we see is an early example of horn moulded with the application of heat and pressure. The hurry is to do a number of triangles before the tool he’s using cools down. There is a parallel in book binding, hot stamping, where it is frequently used with gold leaf to decorate the cut edges edges of the leather cover. I did some experimenting, making a triangular stamp by filing a nail head to shape, and heated and pressed it on to a trial piece of horn. The heat source was a beeswax candle to match what would have been available to him. I was able to get four triangles from one heat, three of them deep enough to take ink and without the awful burning hair smell one usually associates with heating horn. I got a similar wavering of the bases too, although with practice and a proper way to grip the tool, I would be neater. A purpose made tool would probably hold the heat better and enable more triangles to be done. Something else Mindum was accomplished at was the skillful use of colour. Many of his horns have the main design in black, but with details highlighted in red. This is an incredibly difficult feat, the ink is usually applied in patches to the cuts and then wiped off and spread evenly. One colour tends to go everywhere and leave no opportunity to use any other. There’s only one other place I know where black is the primary colour and red used for highlighting and emphasis. While we’re on the subject of printed works, there’s a striking similarity in the execution between Mindum’s figure of Jane Ayres from 1593 and many woodcuts of female figures from poetry books and broadsheets. 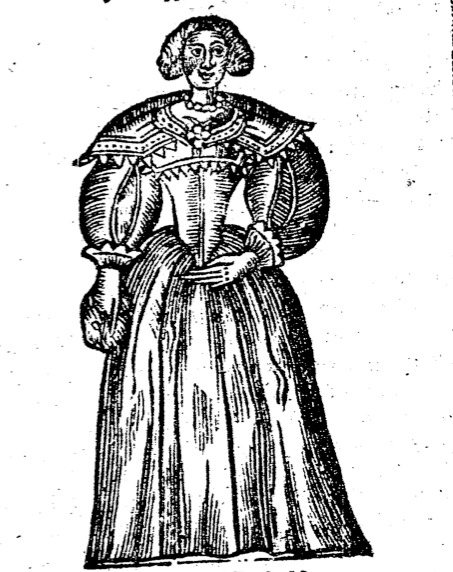 Behold Jane Ayres, and the petitioner from A Maid’s Petition (1647). The Maid is a little late but standing in a similar way to Jane. A talented person with Google will find there are any number of woodcuts contemporary with Mindum showing similar features, all standing with the left arm cocked in the same way. Note also the use of lines of different thicknesses similar to the woodcut design, rather than relying exclusively on hatching like on scrimshaw or the other shoehorns and cider cup I’ve shown above. I’m going to go a step further than Ginsberg, the design elements don’t just come from design books, they come from books, pamphlets and broadsheets. The guiloche that Mindum commonly uses to contain the year, is a common feature on the title page of published books, usually containing the publisher’s name, or the year. The ballad pages show more women standing with cocked left arms and the use of repeating panels of decoration. You’ve probably worked out by now that I think Mindum worked in publishing, possibly preparing woodcut blocks. There is a problem with my theory, woodcuts are cut away from the inked area, the horns are more like copperplate plates, with the voids filled with ink. I’d still like to think that I’ve been able to give him some sort of context and advanced the story somewhat. There is one piece of evidence I’ve left to the end, to me it’s the most compelling and involves another mistake. 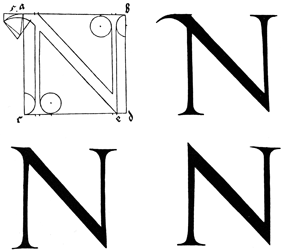 Mindum’s lettering and numbers are well formed, as a tradesman working in London at the end of Elizabeth’s reign, he’s likely to have been literate and numerate. The probability increases further if he was a Protestant,2 which fits the assessment of the Royal Society of him being a continental refugee.3 On close inspection of the 1604 horn, the digit ‘4’ in the date has been carved in reverse. This isn’t an easy mistake to make, even the illiterate and innumerate can generally pick the difference. Really, the only sort of person who would make this kind of mistake is one who is used to carving letters and/or numbers backwards all the time. 1 Journal of the British Archaeology Association, volume 18, 1862, figure 15 between pp 374 & 375.